Thousands of demonstrators have taken to the streets of Mexico City and other major cities in response to the brutal July 31 murder of Rubén Espinosa Becerril, a photographer and investigative reporter, along with four women. Twenty-four hours after family members reported his disappearance, on Friday afternoon police discovered his body with those of the four women in a Mexico City apartment. They had been bound, tortured and each received acoup de grâce to their heads with 9mm bullets. This is a clear political execution-style murder of a critic of the repression of the press and of Mexican corruption. Rubén’s death followed three years of government persecution, intimidation and beatings at the hands of police in the southeastern Mexican state of Veracruz, which he fled because of threats to his life. He is the thirteenth reporter from Veracruz to be murdered since 2011 (the fourth this year). Three others have disappeared and are presumed dead. Veracruz is a microcosm of a nationwide state terror campaign against reporters, journalists, photographers and other media workers. According to a Mirada Crítica (Rompeviento TV), some 103 journalists have been killed since the year 2000. Another 17 are missing. Others have been detained unlawfully for long periods of time, or kidnapped for ransom. Noel López Olguín, Miguel Ángel López Velasco, Misael López Solana, Yolanda Ordaz, Regina Martínez, Guillermo Luna Varela, Gabriel Huge Córdova, Esteban Rodríguez, Victor Manuel Báez Chino, Irasema Becerra, Gregorio Jiménez, Moisés Sánchez Cerezo. Rubén Espinosa. The three listed as disappeared are Sergio Landa Rosales, Miguel Morales Estrada, and Manuel Gabriel Fonseca Hernández. In addition there have been scores of unresolved deaths of young people and human rights activists. No one in Veracruz has been convicted of any of these crimes. Rubén worked as a photojournalist for various agencies, including the AVC news (covering daily news), the left-leaning Proceso weekly magazine in Mexico City (covering social struggles) and the Cuartoscuro photography journal. In 2007 he settled in Xalapa, Veracruz. He was passionately committed to the struggle against the repression of newspaper reporters by Veracruz state authorities. He had been the object of death threats by government officials for taking photographs exposing government attacks on students, workers and reporters. Veracruz, like the federal government, is governed by the Institutional Revolutionary Party (PRI) of President Enrique Peña Nieto. In November 2012, during the anniversary of the Méxican Revolution, [Espinosa] covered student protests against governor Javier Duarte [PRI] over the assassination of Proceso’s main correspondent in Veracruz [Regina Martinez], and was prevented from taking photographs of police beating some students. At that point, a State Government official grabbed him and menaced him: “stop taking pictures if you do not want to end up like Regina”. Following the first series of murders of his fellows, Rubén participated actively in the mobilizations and demonstrations by reporters demanding justice for their comrades and an end to attacks. On September 14, 2013, while covering the repression of Veracruzana University teachers and students rallying in Lerdo Square in Xalapa, he and other reporters were attacked by State security forces that confiscated their equipment and forced them to erase their photographs. Rubén was beaten. He sued in court over the threats, the beating, and intimidation; the persecution campaign aimed at Rubén by the Veracruz government only accelerated after that. 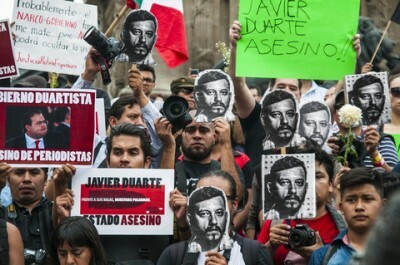 The campaign of intimidation, torture and executions of journalists continued; by February 2014, following the execution of reporter Gregorio Jimenez, also in Veracruz, the newspaper photographers collective Fotorreporteros rallied in Mexico City demanding governor Duarte’s resignation. Rubén Espinosa was actively involved in the protests. One of the female victims, Nadia Vera Pérez, 32, originally from Oaxaca State, had also been politically active in Veracruz, as a member of the #Yo soy 132student protest movement that rejected president Enrique Peña Nieto and the ruling PRI. Vera was raped before her execution. She herself had been among those beaten by members of the Public Security Agency during the November 2012 protest. Nadia had been a member of the Xalapa Student Assembly; was an anthropologist and a promoter of culture; she was executive producer of Cuatro X Cuatro, a contemporary dance company, and coordinated the independent film and video festival OftálmicaIn an interview with Rompeviento TV that took place last November, Nadia Vera declared that if anything happened to her or her fellow activists, the culprits would surely be Governor Duarte and his cabinet. Vera also spoke of the underground repression (by drug gangs) working in tandem with the official repression (by the government) to exploit, blackmail and repress the population. A second female victim was identified as Yesenia Quiroz Alfaro, 18, a make-up professional, originally from Mexicali, Baja California. The other two victims were identified as Alejandra, a domestic employee, and Simone, a Colombian woman. The war on media workers in Veracruz and other Mexican states goes hand in hand with a general war against the working class and youth. Behind its democratic façade and under the cover of a US-backed war on drugs, the Mexican military together with federal and state police agencies, have taken on the role of occupying force, free to beat, torture, execute, disappear, and detain for as long as it sees fit, anyone that is perceived as a threat to the Mexican ruling class. On July 30, a day before the killing of Rubén Espinosa, Nadia Vera, and the other three women, Peña Nieto appeared in a ceremony honoring the Mexican Army and Navy for their role in internal security. The president applauded the military for being an example of loyalty and patriotism, despite the involvement of the military in the execution of 21 youth in Tlatlaya, Mexico state, in June 2014 and the disappearance of the 43 normal school students in Iguala, Guerrero State in September 2014. Today’s regime in México, under Peña Nieto and with the collusion of all the political parties, more and more resembles the Southern Cone fascist-military-fascist dictatorships of the 1970s. Twenty-five years following the end of the Pinochet dictatorship in Chile, the Mexican government terrorizes the population in order to impose the privatization of state-owned enterprises, and the destruction of public education in the interests of the financial aristocracy. On Sunday, journalists and media workers demonstrated in Mexico City, Xalapa, Oaxaca, Zacatecas, Sinaloa, Puebla, Guadalajara and Washington DC, denouncing Peña Nieto and Duarte and demanding justice for Rubén Espinosa, Nadia Vera and the others.